OK – so this isn’t the prettiest salad, but it’s a classic. The wedge salad first appeared on the American gastronomic scene in 1916 and iceberg lettuce itself, was madly popular during the 1920’s. General consensus places this salad as the “it” menu item at higher end restaurants during the 1950’s and 1960’s. Eventually, this conventional appetizer faded due to the lack of nutritional value in iceberg and the discovery of more exotic and flavorful salad ingredients. However, the wedge is experiencing a resurgence in popularity. It’s listed in the salad section of the trendiest restaurants. In all honesty, the ingredients are hard to resist – blue cheese dressing, crumbled blue cheese, crumbled bacon and chopped tomato (sometimes green onions and cucumber as well). The combination of these rich flavors in contrast to the crunchy, watery, fresh iceberg is perfect. And for some reason, I find cutting down a wedge of lettuce significantly more fun than poking at fussy greens. This healthy version of a wedge is just as satisfying. With a flavorful green goddess dressing and chopped tomato, it’s open to the addition of more flavors such as feta cheese, toasted nuts and assorted chopped vegetables (even a bit of bacon, which I believe complements most dishes). Reinventing a classic is fun but don’t hesitate enjoying the original as well. 1. In a food processor or blender, pulse the basil, green onions and garlic until minced. Add the ranch dressing and lemon juice and process until fully blended and basil has been finely chopped. 2. Cut iceberg lettuce into four to six wedges. 3. Put one wedge onto each plate and spoon dressing over and sprinkle with diced tomatoes. Serve immediately. A- Live in Europe and don't have ranch dressing let alone Paul Newman's? B - Really don't like basil? Great questions! I'm so glad that someone in Europe is reading my blog. As far as basil, feel free to substitute in another herb like parsley or cilantro. 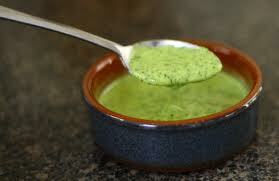 The basil helps to make this dressing "green", as will the other two herbs. Oh yeah! I love reading your blog! Such great recipes! The peaches and ham salad is a classic as far as I'm concerned as are peach wedges wrapped in prosciutto and served on top of rocket salad with a balsamic vinaigrette. I tried your Salmon with salsa, only I had to use another fish (catfish filets in fact), because I'm allergic to salmon.